A senior lady with friendly grandmother glasses, a kind smile and short hair opened the door. We were the first visitors there that day. Her badge said 'Sister Vivienne' and after a bit of us trying to understand her French and her trying to understand our English, we realised that she was telling us to wait for the pre-recorded audio guide/cassette to start us on our tour through the house. We stood in the living room of St. Thérése's childhood home. In front of us, the fireplace where would look forward to filled stockings on Christmas. 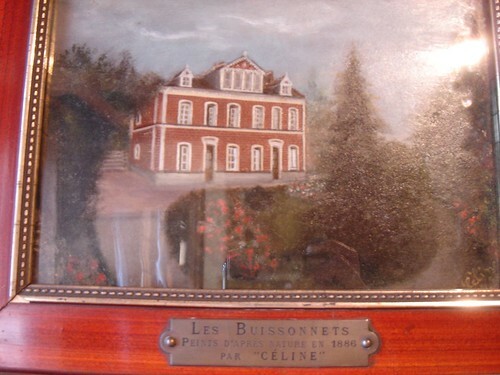 Also on the wall in the room was a painting of Les Buissonnets by Thérése's older sister Celine and behind a plastic, see-through barrier was the dining room where the family had their meals. I could almost picture the kids, excited on Christmas day, and the family sitting down to dinner. Next, we went upstairs. 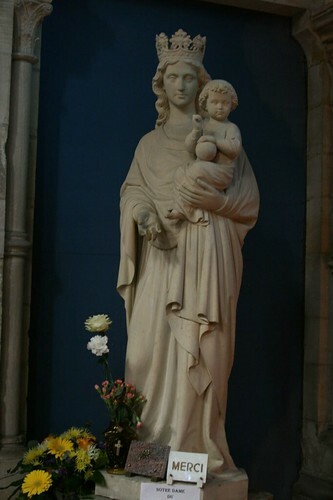 There on a wall, was a picture of St. Thérése's parents and on the opposite wall, on a chest of drawers, was a copy of the statue of Mary that overlooked Thérése as she lay sick in bed. 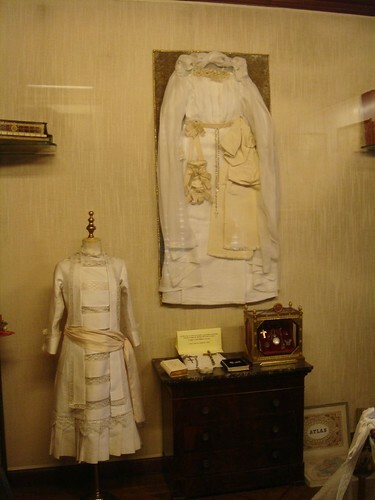 We were then ushered into a 3rd room which displayed an exhibition of Thérése's belongings, her first communion dress, another dress she wore for special occasions, her toys, her tea-set, her mini- stove toy kitchen with its small pots and pans, her puzzle bricks, books, the cross of Christ which she prayed in front of for the criminal Pendanzi (?) I wish I'd checked to see if her rosary was there. There was also a cage there with a toy bird and perhaps, a music, accordion-like keyboard somewhere, I think. Somehow those two items caught my eye, as I wondered if Thérése sang, or liked music. 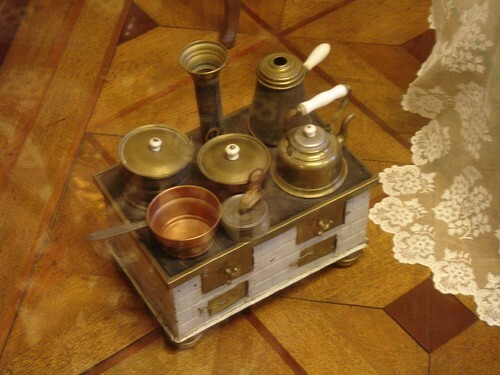 I liked the mini-stove set too. Very cute. Can imagine her playing that with her sisters. There was also a bookshop in the same room, but most of the books were in French. So after Les Buissonnets, we made our way to St. Pierre Cathedral, or rather, in English, St. Peter's Cathedral for the 11 a.m mass. 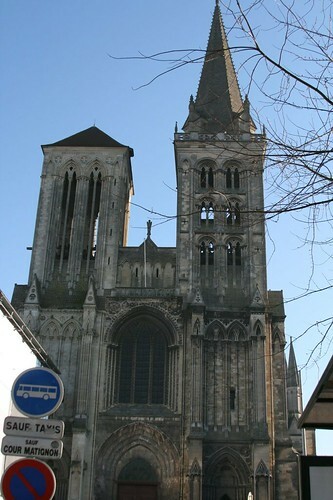 When we got there, the bells were already ringing away in the bell tower, calling people to mass. It was nice to attend mass at the same parish as St. Thérése had attended as a child, with her family and her dad. The parishioners were mostly from the area, and there were many kids and families in the congregation. So despite the frigid conditions in the church, there was the warmth there of something familiar that the parishioners, in their community parish brought with them. Good thing I had checked up on the readings for the day beforehand, since everything was being read in French. The readings of the day were about Adam and Eve's fall and the gospel was about Jesus's temptation by Satan in the desert. Where Adam and Eve failed to resist temptation and thus fell, Jesus resisted temptation and was obedient to His Father's will. After mass, we quickly walked around, following a leaflet that listed the various places to see within the church that related to St. Thérése's life. 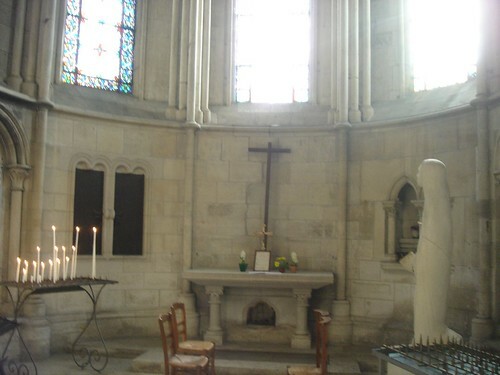 Places like the wooden confessional where Thérése received the Sacrament of Reconciliation and the marble altar that St. Thérése's father had donated to the church. He was a watchmaker and a jeweller, and was presumably quite well-to-do. 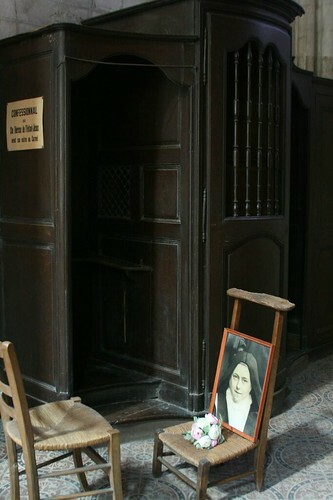 Confessional box where Therese made her first confession. After this, we headed across the street to have lunch at Le Patio, where I had a lamb dish and Kavin had an omellette, a sandwich and a cup of coffee. The coffee tasted good. 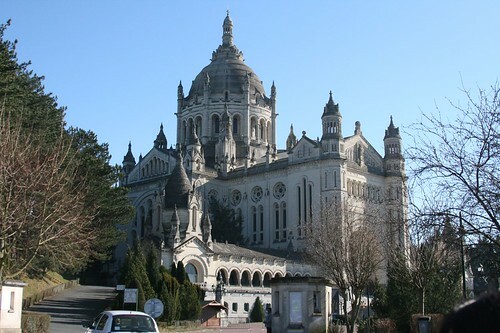 Then we headed to the Basilica of St. Therese. It was a beautiful day, clear blue skies. We went first to the crypt. 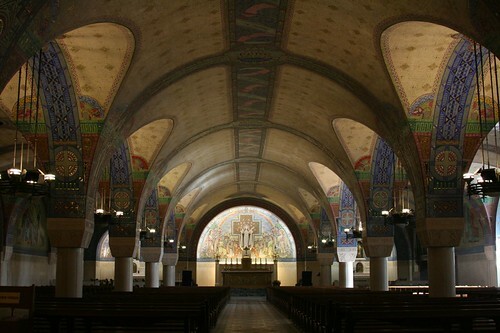 It had beautiful mosaic tiles all over the ceiling with images from Therese’s life, from her childhood to her death. 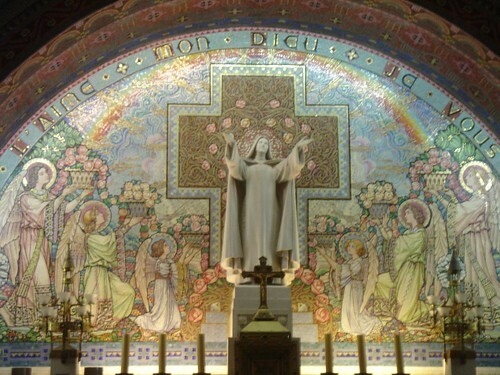 There were also little chapels dedicated to her favourite saints and at the very front of the crypt, above the altar, was a statue of St. Therese above the tabernacle. Off to one side, the Child Jesus smiled over a side altar. 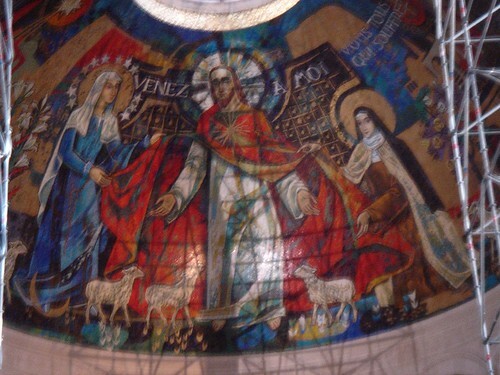 Mosaic commemorating Therese's entrance to Carmel. 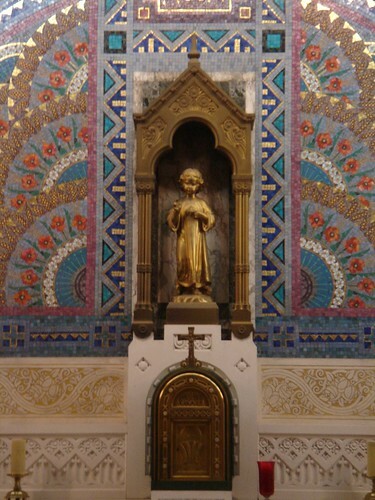 Altar with the child Jesus above the tabernacle. At the back of the church, an exhibit had been laid out, with pictures from Therese’s life in Carmel (unfortunately, Carmel convent was closed for renovations and we could see the convent where she had spent most of her time as a nun) and pictures of her family. 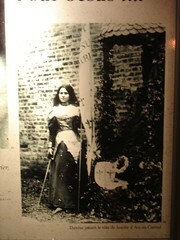 There was even a photo there where Therese had dressed herself as St. Joan of Arc! I thought that was so cute, the future saint dressed as a saint that she herself had admired. A future saint, dressed as a saint, a warrior-in-making in her own way. I wonder if there is a section in her book where she talks about dressing up as Joan of Arc. I think she does. Looking at her family tree, it was also interesting to note that her sisters had lived quite long lives as opposed to Therese’s 24 years. Kavin pointed out that two of her sisters had lived to see both world wars. We went upstairs after this to the basilique itself. It’s a huge and very beautiful church. 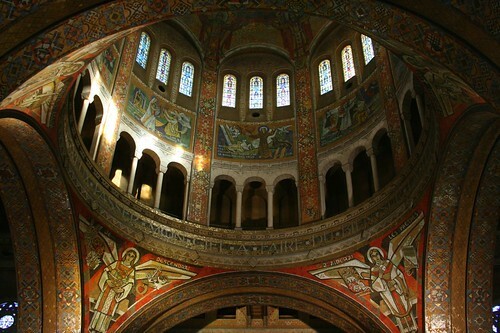 Orange-red mosaic tiles all over added a warmth, a passion, an almost child-like love of colour within the church. It’s the most colourful church I’ve seen in France, apart from the Notre Dame de Fourvière in Lyon. The dome was so big, Kavin was pretty awe-struck too. The stained glass windows had some words on them. I assume they were St. Therese’s words. 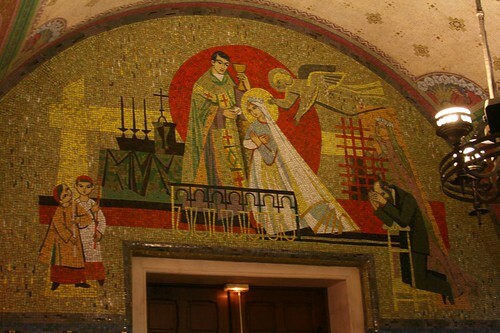 On the arc of the dome, there were mosaics of flowers and also a mosaic featuring a single rose. I loved the main altar, showing Our Lady on the left and Therese on the right, the resurrected Christ in the middle and the little lambs (so cute) below. 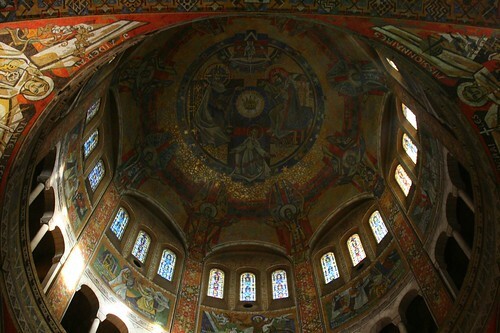 The huge dome of the basilica, from within. 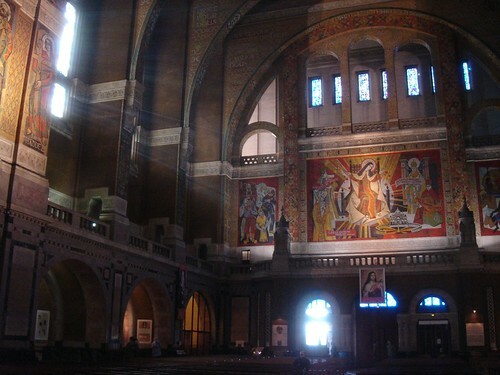 Mosaic at the front of the main altar. View of the back of the church. 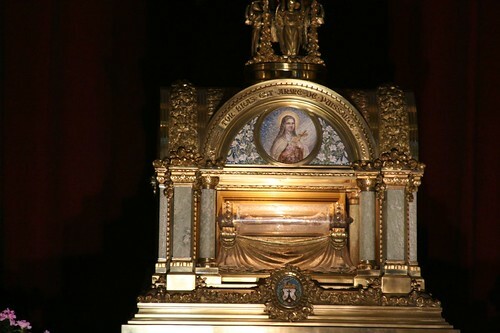 But the best part of the church was the right main chapel, where a reliquary held the bones of St. Therese’s right arm, the arm with which she wrote her ‘Story Of A Soul’. It was moving to see these right arm bones of St. Therese, for here, laid the physical relics of the saint I’ve been so inspired by. Here lay the physical framework and strength from which she wrote her story. 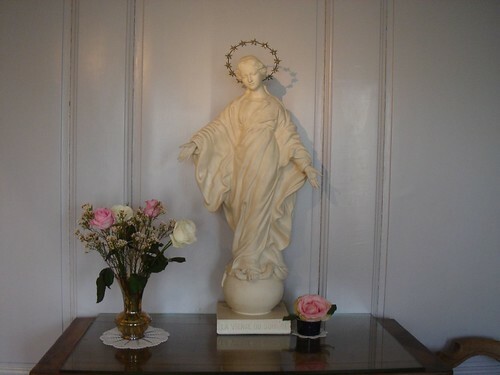 Here was the physical part of her that she had asked Mary to guide, for, in her own words, “Before taking my pen in hand, I knelt before the statue of Mary and I begged her to guide my hand so that I might not write a single line that would not be pleasing to her.”. This was the part of her, offered up to God, that now lay in this reliquary. I look upon St. Therese as an older sister of sorts, as a role model. God used her through her story, her words, her simple loving ways and her wisdom. This humble Therese, who in life, never knew the recognition that came with the spread of her story after her death, was not concerned with fame or fortune. All she wanted to do was to love Him as best as she could and to get to Heaven where she hoped she would be able to spend her time in Heaven doing good on earth. She wanted to quench the Lord’s thirst for souls. 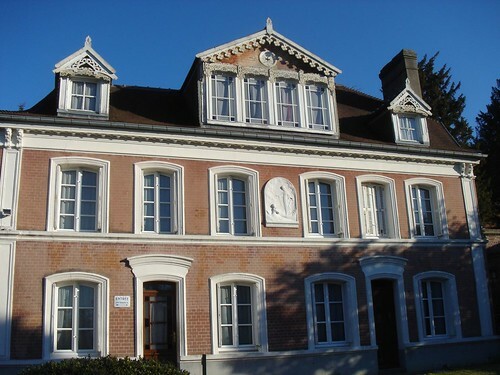 This thread of humility, of being unrecognized here on earth, seems to be a common thread in the saints I’ve come across on this trip to France, for St. Catherine Laboure was also unknown and kept Our Lady’s visits to her a secret for so many years. Anyway, I knelt in front of the reliquary and asked the saint’s help in my own writing, my music and ministry. I hope that she will guide me to writing, singing and making music that pleases Him. I hope to do with my left arm and hand what she did with her right, ie. to always write what is pleasing to Him, no more, no less. Kavin and I walked outside the basilica after this and saw the place behind the church where Therese’s parents were buried. 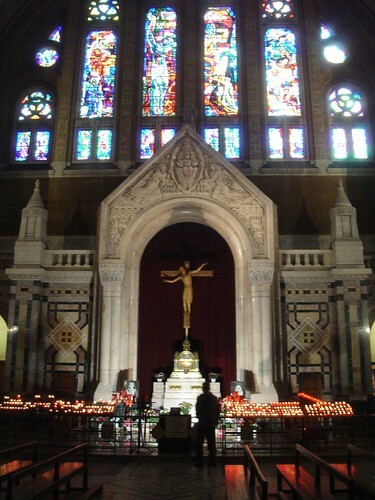 Above their tombstones was a statue of St. Therese and behind her stood the majestic church named for her. God truly sought to raise his little flower. What a wonderful testimony to His providence, that He had chosen to honour his little saint with a church to her name and to make her a tree of comfort for all who learn about her ‘little way’. The littlest, the least has truly been raised up high. The speed at which she attained sainthood seems unmatched. Even St. Joan of Arc, matyred in the 1400’s was only declared a saint 500 years after her death. 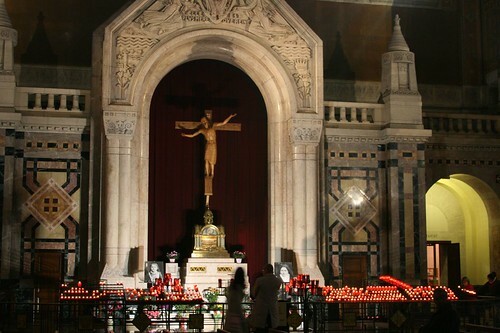 In contrast, St. Therese was declared a saint less than 50 years after her death. 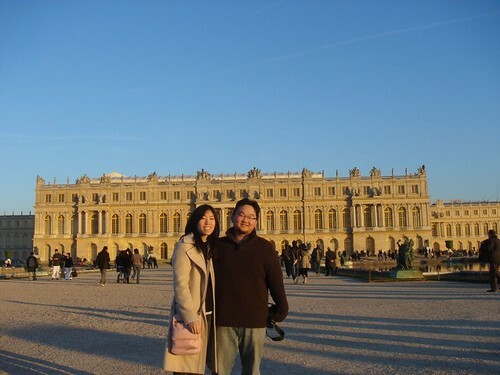 After the visit to the Basilica, we drove back towards Paris, with the intention to stop by at Versailles along the way. The little Opel Corsa we had rented packed quite a punch, remaining steady on the road even at 150 km/hr. Pretty cool car. So we got to Versailles a little after 5 p.m Kavin was excited to see the buildings that he had initially seen ‘virtually’ in his computer game. 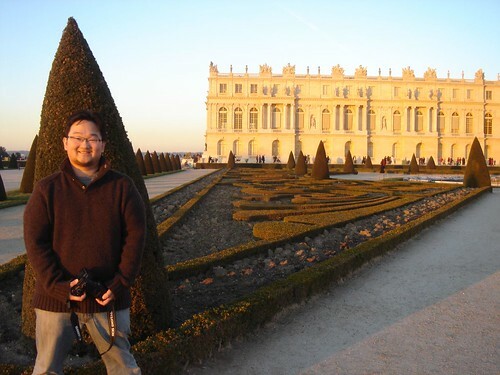 We took some photos in the huge Jardins (gardens) and in front of the buildings, then headed back to Paris, returning the car at the Hertz carpark on Rue du Maine, then walking back to check into a new room at the Hotel Des Academy des Arts. Kavin tries to be a tree at the Jardin. Then we headed to Sapporo for ramen. Mmmmmm… Along the way, we heard some wonderful music from a busker in the subway who was playing his violin. Absolutely gorgeous. for Laudes just now in the Abbey. It was beautiful. Tea but they were out of it. the waves gently lapping against the foot of this rock. be let in for the 8 a.m Laudes. and technology in the midst of the ancient. Pretty cool. 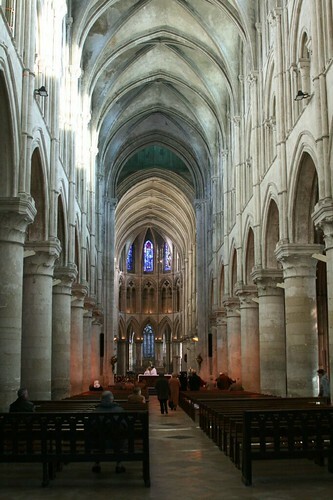 the abbey to join the monks within the abbey at Laudes. everyday at this hour, as it has been done for close to thousand years. were brighted and the monks and nuns began to sing. small tabernacle from the brightening sky outside. Psalm 3 and Psalm 26, the canticle of Zachary. to hear and discern the Lord's voice in this foreign tongue. a gorgeous view if only for a few minutes. decaffeine. Now I'm ready to go along on my way. I made my way back to the hotel and woke Kavin up. sung at Laudes in the morning, was there at the gate. she was even playfully wagging her finger at him as she chided him. So Kavin and I made our downstairs to the little chapel. the 20 people who were sitting down in silence. and he was there on a retreat. in that small chapel was heartwarming. understand the gospel being proclaimed in French. germinate and flower in His time. and blood with such tenderness. sides of the altar, hands cupped to receive His body. took his time to specially bless each and every one. of grace given by Him. 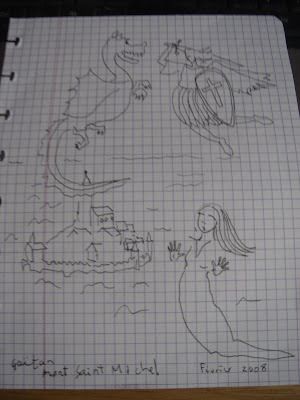 I was the girl he had depicted in his drawing. restaurant. This time, both of us had the lamb dish. 2 hours to reach Lisieux from Mont St Michel. run by a French guy and his Vietnamese wife. crepe (with chicken and curry). They were both good. of coffee ice-cream for Kavin. Here's a link to more pics taken at Mont Saint Michel. Too many to post here.